New York art expert Rebecca Katz is a highly successful art authenticator with a huge secret. What her colleagues at Atherton’s Auction House don’t know is that Rebecca has a special ability—she can speak to the souls of the artists embedded in anything made by hand. And they are everywhere. Whether the artist is a famous 18th-century French court painter, or the unsung Chinese designer of a handmade suit, they all tell their stories to the only person who can hear them. Rebecca puts all her trust in the souls of the things she encounters, so she is unprepared when a 2nd-century Afghan dagger lies to her about its provenance, raising questions about its ownership and embarrassing the auction house. Sent to carry the disputed dagger to the Atherton Miami office until the scandal subsides, Rebecca is kidnapped by international thieves who want the priceless object. Objects alone cannot help her escape, so for the first time since her childhood, Rebecca must put her trust in the odd assortment of strangers she meets as she attempts to recover the dagger and reclaim her reputation. As her friendships blossom and attraction for two men tempts her, so does the fear that if she reveals herself, she will lose everything she has come to value. You can buy my book , read a full except, or write a review on Amazon.com. If you would like a signed copy, send it along with your mailing address to Stephanie Wilson Medlock, P.O. Box 307, La Porte, IN 46352-0307. I would be delighted to sign it and send it back to you. “This suspenseful novel tells the tale of Rebecca’s physical and emotional journey in a unique, often captivating manner. Her story quickly transcends the conventions of a mere mystery novel to become a story full of depth and meaning, as her unusual gift comes to symbolize an approach to life that she must leave behind. Her growth as a character plays against the intriguing backdrop of the antiques world, and the story delves into details of psychology, history and art along the way. Find more reader reviews here on Amazon. 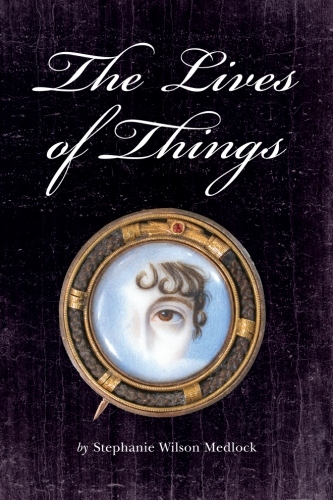 Image of lover’s eye memorial brooch on cover courtesy of The Three Graces, www.georgianjewelry.com.